Provides statistics on how our website is used. Helps us to improve the website by measuring any errors that occur. Welcome to the website of the Thames Valley Methodist Circuit and its churches positioned on either side of the River Thames as it meanders towards London. It includes the towns of Maidenhead in the West, and Slough and Windsor in the East and their surrounding villages. You can be assured of a warm welcome at any of our places of worship. Our church buildings and congregations vary in size, but all have regular services and social activities. 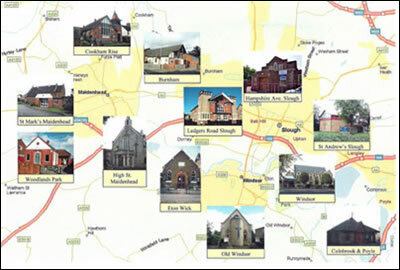 The map shows the relative position of each church within the circuit. From any page, to find out about a particular church, select "Our Churches" in the Navigation Bar and choose the church you are interested in from the list displayed. The Circuit Plan gives details of services. The Thames Valley Methodist Circuit seeks to fulfil the calling of the Methodist Church which is to respond to the Gospel of God's love in Christ and to live out its discipleship in worship and mission.